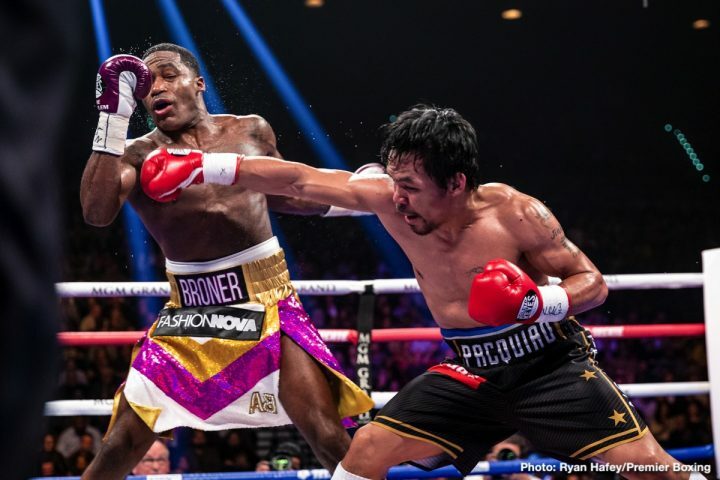 By Eric Thomas: Daniel Jacobs was impressed with what he saw from Manny Pacquiao with his win over Adrien Broner last Saturday night at the MGM Grand in Las Vegas, Nevada. Jacobs feels that Pacquiao (61-7-2, 39 KOs) showed that he still has a lot left in his gas tank at age 40-years-old with his 12 round unanimous decision win over Broner on SHOWTIME PPV. With that said, Jacobs sees IBF welterweight champion Errol Spence Jr. (24-0, 21 KOs) as a potential problem for Pacquiao, and he thinks that could be a tough fight for him if the two of them face each other. Jacobs considered Spence an upper echelon welterweight, and he views him as a different type of talent than the fighters that Pacquiao has been beating recently. “A guy like Errol Spence or a guy like Floyd Mayweather, they’re top echelon,” Jacobs said to Fino Boxing when asked about Pacquiao fighting Spence or Mayweather. “We don’t know yet, but we do know that Pacquiao lost to Mayweather, and that’s about as high as it gets for him [Pacquiao]. I see him against a guy like Spence; it’s a little tricky. It would be interesting to see it if it happens,” Jacobs said. If Pacquiao chooses not to fight Spence, there are other guys that he can fight under the Premier Boxing Champions banner. Pacquiao can mix it up with Keith Thurman, Shawn Porter or Danny Garcia. Those are three matches, besides Spence, for Pacquiao to fight on pay-per-view to make good money. If Pacquiao wants to cross the pond, he can fight the Top Rank promoted Terence Crawford. It wouldn’t be all bad if Pacquiao faces Spence and loses to him. Pacquiao would make a lot of money fighting Spence, and there would be less fallout from a loss to him than it would if he gets beaten by another welterweight like Keith Thurman, Shawn Porter or Danny Garcia. Those are guys that Pacquiao can probably fight if he wants to. He would take more criticism from boxing fans if he loses to those guys than he would if he were beaten by Spence right now. Pacquiao might not need to worry too much about Mayweather. He seems like he’s in the stage of his life where he’s rich, and content with what he’s done with his career. The 41-year-old Mayweather (50-0, 27 KOs) isn’t hurting for money, so he’s not going to likely come back to take a chance on losing to Pacquiao in a rematch. Mayweather last fought against a top boxer in 2015 and that’s too many years for him to be away from world class opposition. One to two years is bad enough to be out of action, but when you’re talking four years of inactivity, it’s beyond what is possible for a boxer to return with a good chance of winning. Mayweather’s a winner, and he doesn’t want to come just to get a payday if it means that he’ll suffer his first career defeat. Mayweather was at ringside for a reason last Saturday night; to scout out Pacquiao, and to make a decision whether he can beat him. If Mayweather was going to come back to fight Manny, he would have spoken up last Saturday night when he was ringside, and he was being peppered with questions from SHOWTIME. Pacquiao wants the Mayweather fight, but if that match eludes him, then he’s going to fight one of the top dogs at 147, be it Spence, Keith ‘One Time’ Thurman or Shawn Porter. The guy that Pacquiao probably won’t fight is WBO champion Terence Crawford. He’s with Pacquiao’s old promoters at Top Rank Boxing, and they don’t do much business with Premier Boxing Champions, who currently is managing Pacquiao’s career at the moment. Jacobs says he wants to see former four division world champion Broner, 29, return to being the successful fighter that he was in the past when he was winning world titles at super featherweight, lightweight, light welterweight and welterweight. Jacobs feels that Broner needs to be busier as far as his work rate, and he needs to apply more pressure on his opponents instead of hanging back and fighting defensively so much. Pacquiao had the advantage of seeing the blueprint in how to beat Broner with his losses to Maidana, Shawn Porter and Mikey Garcia. It wasn’t a mystery what Pacquiao had to do to Broner, because it had already been shown three times. Broner didn’t make any improvements in his game over the years, so it was a cut and dried situation for Pacquiao to just follow what others had done to Adrien. “I think punching just a little bit more, and coming forward a little bit more,” Jacobs said in giving advice for Broner to turn his career around. Broner has known about his defects in his game for a long time, and he’s not been able to fix his flaws. He’s now about to turn 30-years-old, and it’s become apparent that the problems that he has are going to be permanent. They’re not fixable problems. Broner can’t all of a sudden start throwing a lot of shots because he doesn’t possess the hand speed to throw combinations the way some fighters do. Broner can’t come forward like bigger and stronger fighters at welterweight, being that he’s too weak of a puncher for the weight class. Spence can come forward because he’s a big puncher and he’s a big welterweight. Asking Broner to come forward and throw more punches is a recipe for disaster for him. He’d likely get knocked out or dropped like he was in his loss to Marcos Maidana.